Voyaging aboard an ancient Polynesian canoe reveals a way of living in balance with the natural world. When mainlanders confront the ocean they perceive an obstacle. Islanders see a path. To look out over ocean paths, Vineyarders built widows' walks atop their houses. From these high perches they saw as far as Australia and England . They saw the Sandwich Islands and the coast of California . Islanders perceive the world differently than mainlanders because they are connected to places in it by the sea. This story is about very ancient sea paths - about my Polynesian family who inhabited from time immemorial islands sprinkled like tiny emeralds in the Pacific Ocean . In 1980, I began to explore my Polynesian roots by making a PBS documentary called The Navigators – Pathfinders of the Pacific. My research revealed that the first Polynesians reached Fiji by sailing sea paths from a homeland somewhere in Southeast Asia at about the time the walls of Troy were falling to the Greeks. When Christ was born, they set out against prevailing winds and currents to Tahiti and New Zealand and then on to Hawaii and Easter Island . Thor Heyerdahl got it wrong. 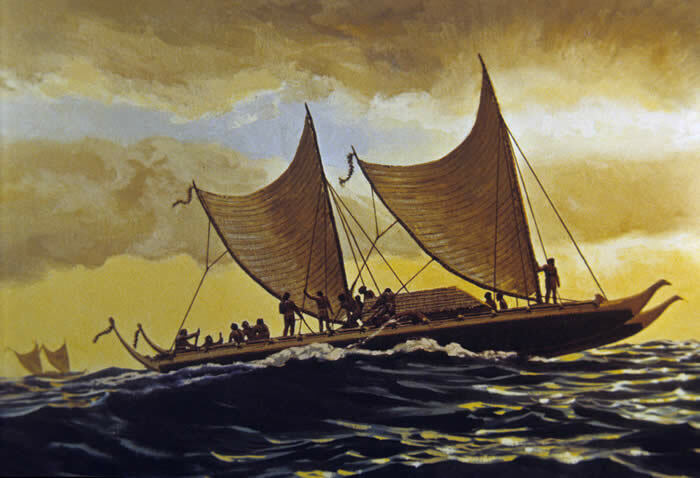 Polynesia was not settled by hapless drifters from the mainland of South America but by sailors who navigated by the stars in powerful double-hulled ocean-going canoes. Polynesia was settled by islanders. In 1999, I was invited aboard Hokule'a - a replica of an ancient Hawaiian canoe - to retrace a traditional voyaging route, the most difficult of all, from the island of Mangareva in the South pacific to a remote speck of land – Easter Island - or, as it's known by Polynesians - Rapa Nui . The voyage would be the ultimate test of ancient techniques of non-instrument navigation. Rapa Nui is only thirteen miles wide and 1,600 feet high. After a passage of more than 1500 miles, we must sail within thirty miles of the island to spot it. A navigational error of only a half a degree of latitude will cause us to sail past. If that happened, the next landfall is South America - 2,000 miles away. 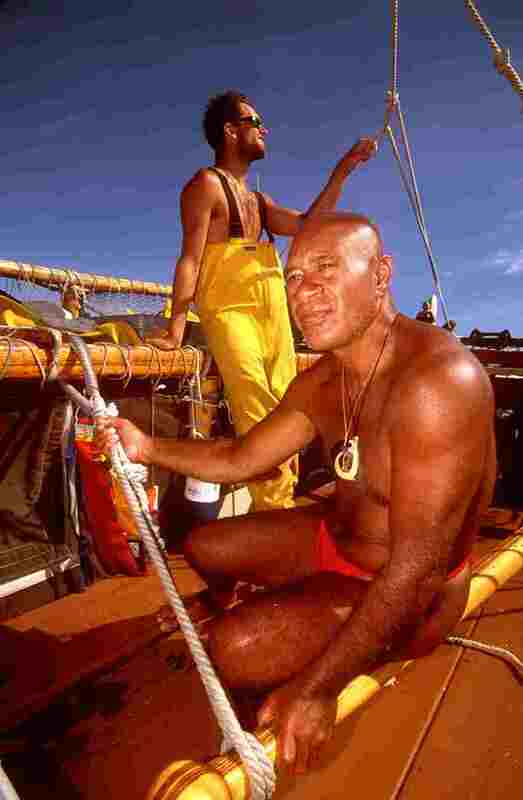 Our navigator, Nainoa Thompson, will guide the canoe as ancient Polynesians once did. Without instruments or charts, he relies instead on an intimate familiarity with nature. For a compass he steers by the rising and setting points of stars. By Mintaka, for example, a bright star in Orion that rises due east and sets in the west. Or by the North Star that sits nearly stationary in the sky, defining the north celestial pole; or the two “pointers” in the Southern Cross - Gacrux and Acrux - which always point south. To guide the canoe at night, Nainoa has memorized the paths of over 130 stars. During the day, he steers by the sun and by steady ocean swells stirred by nearly constant trade winds. To find his latitude he observes the meridian crossing (the highest point of rising) of various stars – but it takes a trained eye. A mistake of a single degree in estimating a star's altitude is equivalent to 60 miles of error on the ocean. Longitude, a vessel's position on the planet in an east-west direction, is another matter. Without a chronometer, Nainoa uses dead reckoning. He estimates daily the course he sailed and the distance made good. And he does this on some voyages for more than a month. On September 21 st , we jump off from Mangareva and set our course almost due east. Instead of a constant slog into the normal southeast trades, we encounter miracle winds – strong from the north, west and south. We run under cloudy skies at 6, sometimes 7 knots. We experience squalls and heavy seas, but Hokule'a rises easily over the swells, channeling tons of water cleanly between her twin hulls. She seems alive - responding to the forces of nature as she was designed to, a testament to the genius of our ancestors. On our 10 th day at sea, the sky clears and presents millions of stars. Jupiter rises ahead – just where the sail blocks the sky – almost due east. When it's my turn to steer, I allow the planet to appear briefly, then push Hokule'a's massive steering paddle down, causing the canoe to turn up into the wind until Jupiter begins to swing behind the sail. Then I drop the blade, Hokule'a turns down – Jupiter reappears. 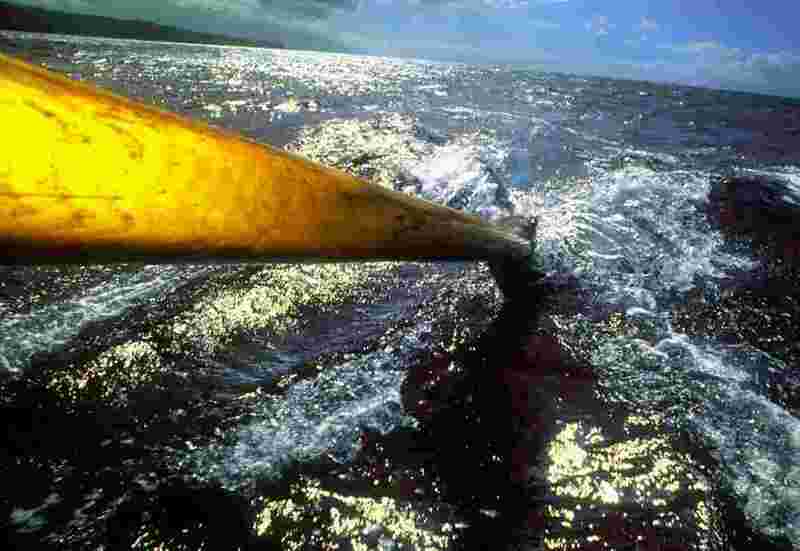 The polished ball of the steering paddle curves into my hand and the canoe speaks to me with pressure against my open palm. The stars cascade overhead while the planet rolls toward daylight. This night, thick with stars, timeless, begins to spin a web of memories. I remember my father. He grew up in Hawaii at a time when Hawaiian culture was dying. A time when native Hawaiians had been nearly eradicated by disease and the language was no longer taught, was in fact forbidden in Hawaiian schools. My father's parents, like so many others, considered it useless to practice an ancient culture. Better to learn the ways of the haole – the white man – and to progress in a new world. The values of a distinct island way of life faded. Then a remarkable thing happened. 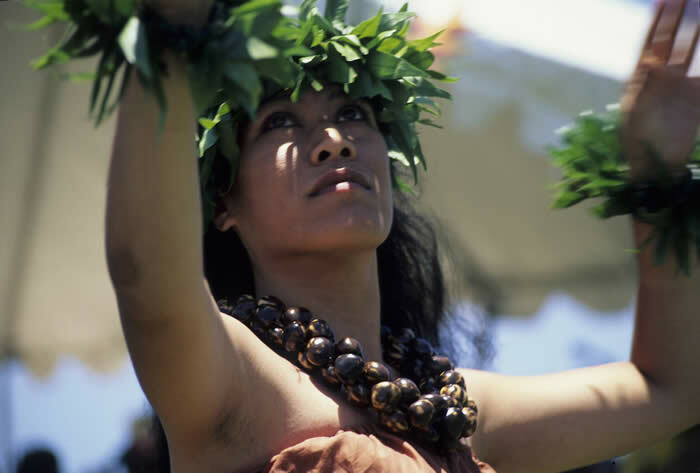 Hokule'a was launched in 1975 and she rapidly became a powerful symbol of cultural revival. their ancient culture – reviving art, dance, language, spirituality and curing practices. Recently, the first class of high school children graduated, having spent their entire 12 years in a language immersion program speaking only Hawaiian. On October 2 nd , our 12 th day at sea - the wind slackens. We proceed toward Rapa Nui over an ocean that undulates toward the stark horizon like a giant satin sheet. One of my watch mates, beginning his turn at the steering sweep, steps up behind the helmsman. He studies how the big southeastern swell moves under the canoe, how the helmsman steers by keeping it off the starboard bow. Then he taps him on the shoulder and steps into his place, accepting the smooth knob of the paddle and the responsibility that goes with it. Aboard the canoe there are many silent rituals like this one - expressive of shared trust. "Voyaging aboard Hokule'a has taught me a lot about the word love," says Ben Tamura, the canoe's doctor, "it's a word that is often misunderstood. People think you can only have real love between a man and a woman. That's not what I'm talking about. Voyaging has given me a feeling of love in an altruistic sense that I can't put into words easily. It's different from how the media or even classic literature portrays it. It's like the word "aloha." How can you define that? There are so many different meanings." “The Hawaiian concept of malama – of ‘taking care,'" explains Mike Tongg, "may have evolved from our heritage of long distance voyaging. Our ancestors learned they had to take care of the canoe and that if they did, the canoe would take care of them; they also learned they had to take care of each other." Sailing under an immense sky dome in an empty sea has had a transforming effect. In mid ocean, a thousand miles from landfall, we are surrounded by a horizon populated only by clouds and stars. We begin to feel totally dependent on the natural world around us. “When you voyage, you become much more attuned to nature,” Nainoa says. “You begin to see the canoe as nothing more than a tiny island surrounded by the sea. We have everything aboard the canoe that we need to survive as long as we marshal those resources well. We have learned to do that. Now we have to look at our islands, and eventually the planet, in the same way. We need to learn to be good stewards." Polynesian islanders recognized the inherent “oneness” of their natural world because islands are fragile places where the interaction of man and nature is clearly seen. When they cut the trees in their valleys they must have noticed the effect of pollution from runoff on their reefs. This may explain why ancient Polynesians constantly balanced the resources of land and sea in their rituals. Some anthropologists call it “dualism” and believe they have discovered in such ‘primitive' societies a yin and yang universal in human thought. But I think it's simpler than that. If ritual reinforces ways of living essential for survival then it is no mystery why Polynesian islanders recognized the aholehole fish as ritually equivalent to a species of taro plant. Today, we are so distanced from this basic understanding of connectedness that we use a relatively new word to express it – ecology. 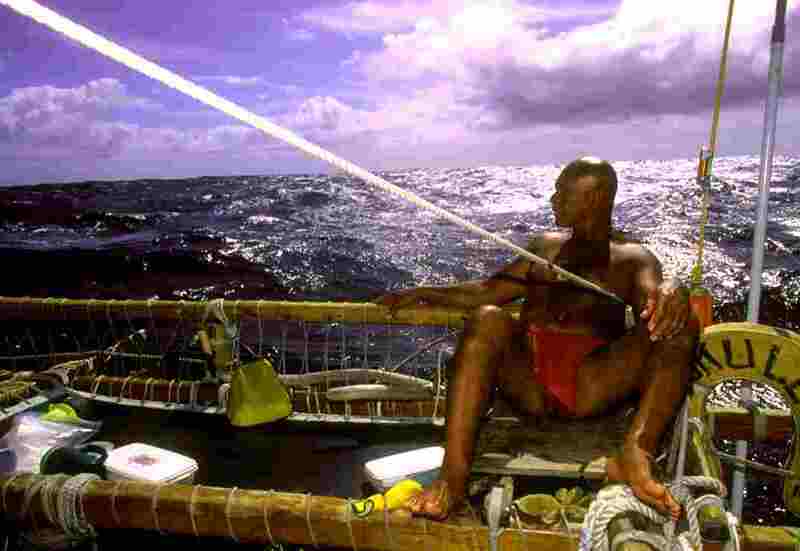 By the time Nainoa had begun this voyage, he had already traveled more than 85,000 miles aboard Hokule'a. He had focussed 25 years of his life on the canoe. By his calculation he had served with 130 different crew members and he had learned much not just about navigation, but about leadership and about planning and executing the complex logistics of supplying a ship at sea on voyages that have lasted as long as two years. Voyaging, not just navigation, had become his life and he coined a new word to cover the complexities of what he had learned. Wayfinding. He says that wayfinding is "a way of organizing the world." He also says that it's "a way of leading," "of finding a vision," "a set of values," and, in general, "a model for living my life." "Our ancestors began all of their voyages with a vision," he once explained. "They could see another island over the horizon and they set out to find these islands for a thousand years, eventually moving from one island stepping stone to another across a space that is larger than all of the states of Europe combined. To accomplish this great feat they needed the ability to plan intentional voyages of discovery, the discipline to train physically and mentally, the courage to take risks and a deep sense of aloha to bind the crew together during the voyage. These are Hawaiian values – vision, planning, discipline, courage and aloha - but they are also universal values. They worked in the past and they will work today. After a while, if you apply all those values, it becomes a way of life." The winds blow strong from the northeast on our 17 th day at sea and on into the 18 th. 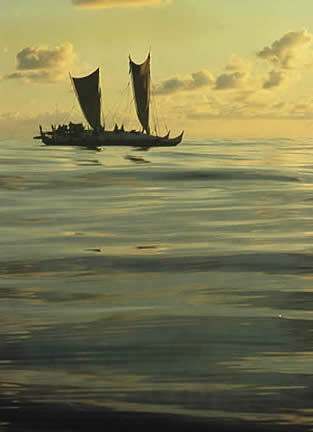 Hokule'a responds by speeding east-southeast - slicing through the waves, producing long tendrils of spray from her bow. Nainoa knows we are approaching Rapa Nui , but clouds have obscured the sky for three days, so he's navigating by dead reckoning from his last latitude fix. Lookouts are posted. 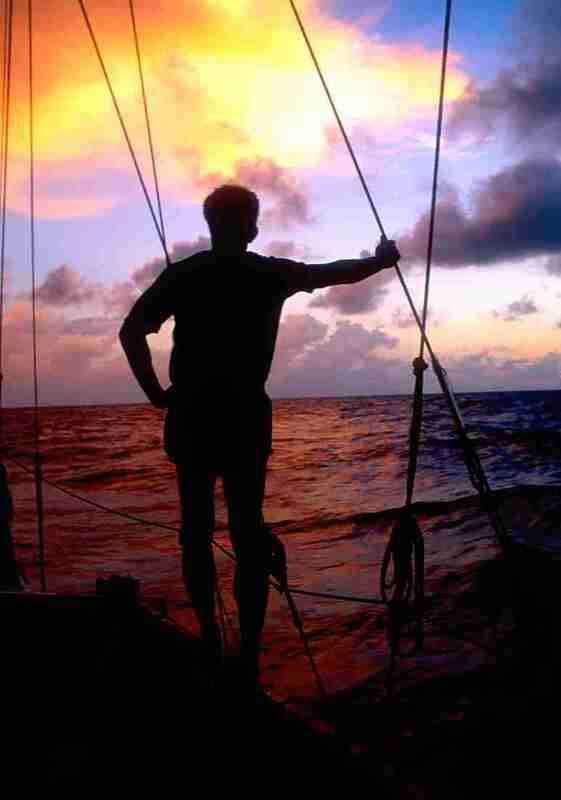 Near dawn, crewmember Max Yarawamai spots two holes in the clouds ahead low on the horizon. Born and raised on the low Micronesian atoll of Ulithi, Max's ability to see islands at great distance is legend aboard Hokule'a. "I looked carefully at the two holes on the horizon," Max explained later, "checking first the one on the starboard side. I saw nothing there so I switched to the hole on the port. I saw a hard flat surface there and I watched it carefully. Was it an island? The shape didn't change! It was an island all right. We had found the dot in the ocean."